It’s my escape, it’s my love language. I love to create beautiful meals for my family and friends. Hopefully they can feel the love and in-turn see the joy I receive when I cook for them, especially when the food I’m making is both nutritious and tasty. When I was young, one of my favorite dishes that my mom prepared for us was crêpes. Every time we had a slumber party, my mom would greet us in the morning with a plate full of crêpes. It was a full production… The table was full of fun toppings like syrup, peanut butter, jelly, cinnamon sugar, powdered sugar, chocolate syrup and such. My mom would sit at the stove and systematically produce these magical crêpes. We would have to patiently wait our turn for the next hot treat. My all time favorite concoction was just a simple crêpe with butter and powdered sugar. 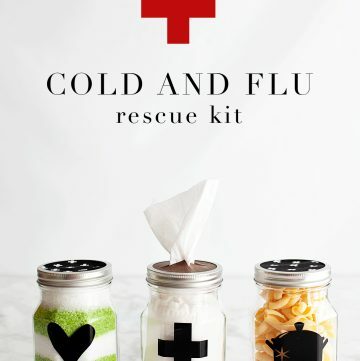 I loved the simplicity even as a kid. While my sisters and friends were loading theirs up with all kinds of goodies, I kept it simple because I wanted to actually taste the crêpe. I didn’t just want it to be a vehicle for a mess of toppings. As I’ve gotten older, my love for crêpes has become even stronger. Our family traveled to Paris a few years ago and one of our FAVORITE memories was stopping at some of the street side crêpe vendors. We would each grab a giant crêpe and snack on it as we walked the streets of Paris. While I was there, I was introduced to the simple addition to my favorite treat. Again, it was just a simple crêpe with butter, powdered sugar BUT with the addition of lemon juice. As a lemon lover, my mind was blown! How had I not thought of this idea before? It was simple beauty. 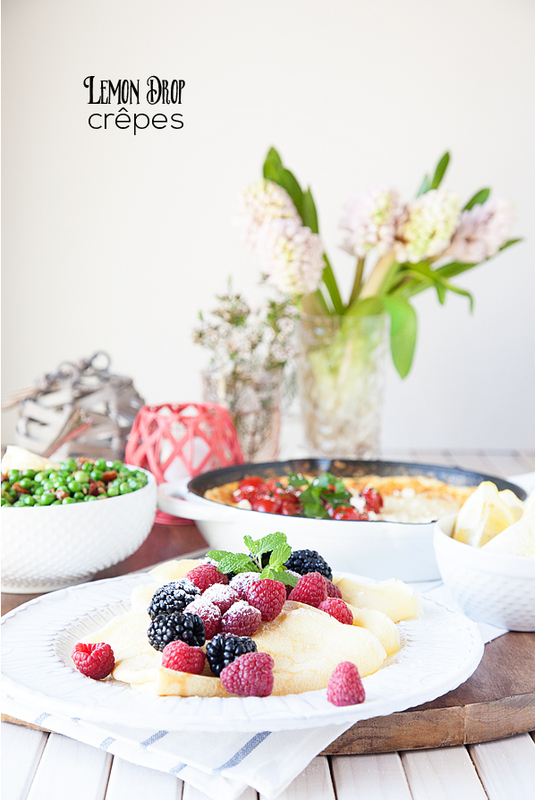 Not too long ago, I was working on some new brunch ideas and I thought it would be fun to create a Lemon Drop Crêpe recipe that would take me back to Paris but also have my own special WhipperBerry spin to a new recipe. 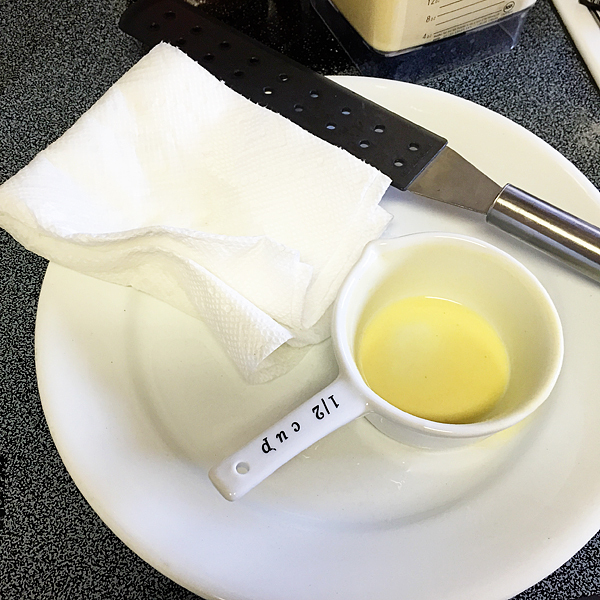 As I was developing this recipe, I started to rethink the butter element to the dish. I loved the flavor that it brings to the crêpes, but I wasn’t crazy about the type of fat that I had traditionally used. 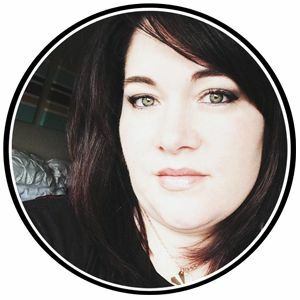 I am a big believer in the idea that our bodies really need good fats as part of overall healthy-balanced diet The key… Finding the right kind of fats. (We cannot claim the list in good fat 5 is better than other good fat sources out there) You want to stick with The Good Fat 5! It’s essential to get the right kinds of fat into our diets. Confused as to what a good fat is? Don’t worry. Ask yourself, is this fat (whatever you are cooking with,) from a plant or from a fish? If it is, you are using a good fat. If it is an animal (other than fish) source of fat like butter or bacon fat, it’s most likely a saturated fat. 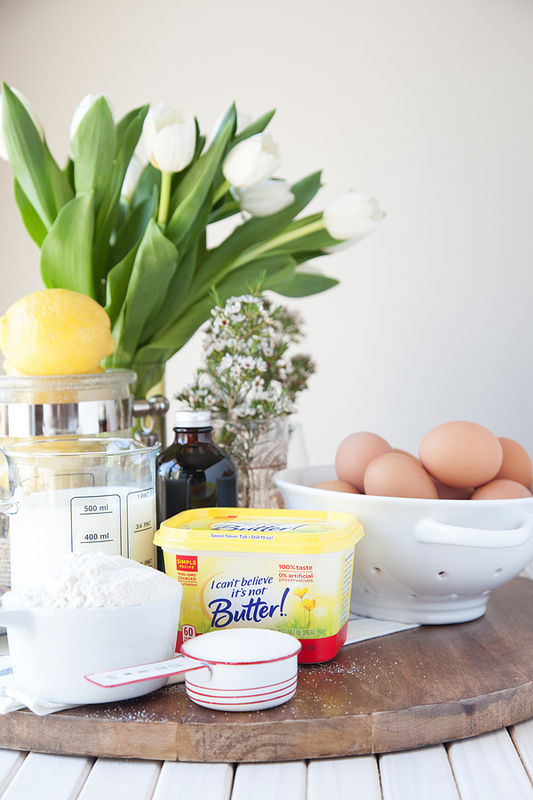 My quandary was… I LOVE the taste of butter, especially with my crêpes, so what should I use? 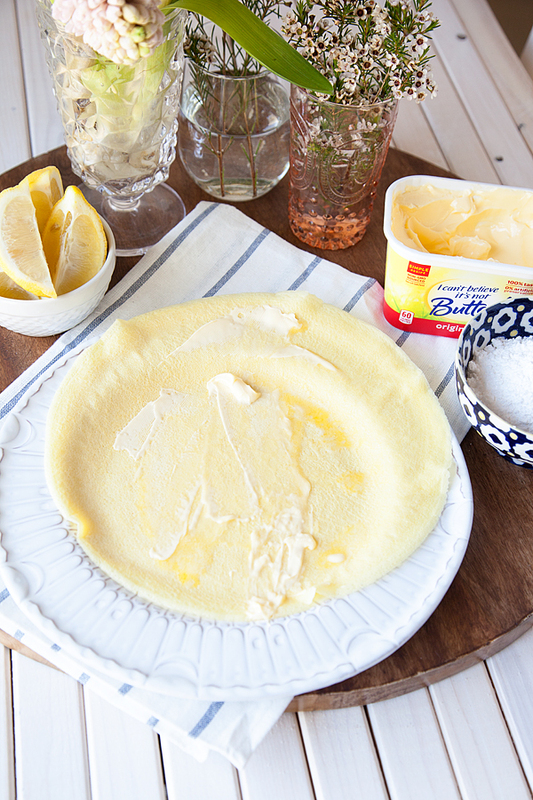 I Can’t Believe It’s Not Butter® is the perfect fat to use for my beloved crêpes. It tastes just like butter, however, it’s created with the good plant-based fats. That means that it’s 40% fewer calories and 70% less saturated fat than butter per serving. Not to mention that it has no artificial flavors, no artificial preservatives and no partially hydrogenated oils. It has non-GMO sourced ingredients, it’s cholesterol free with 0 grams of trans fats per serving.. 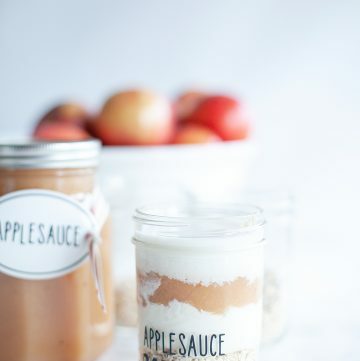 It was exactly what I was looking for—a way to retain flavor but make sure the ingredients for the recipe were still a good nutrition alternative, which you would never expect in a dessert! You can find out more information about I Can’t Believe it’s Not Butter® here. 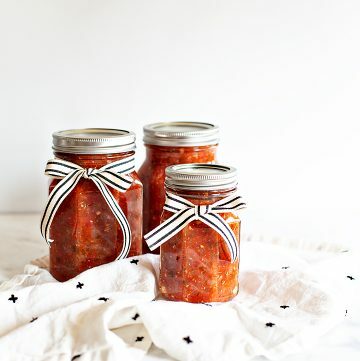 Click here for some other fun recipes that celebrate the role of good fats in our diet. 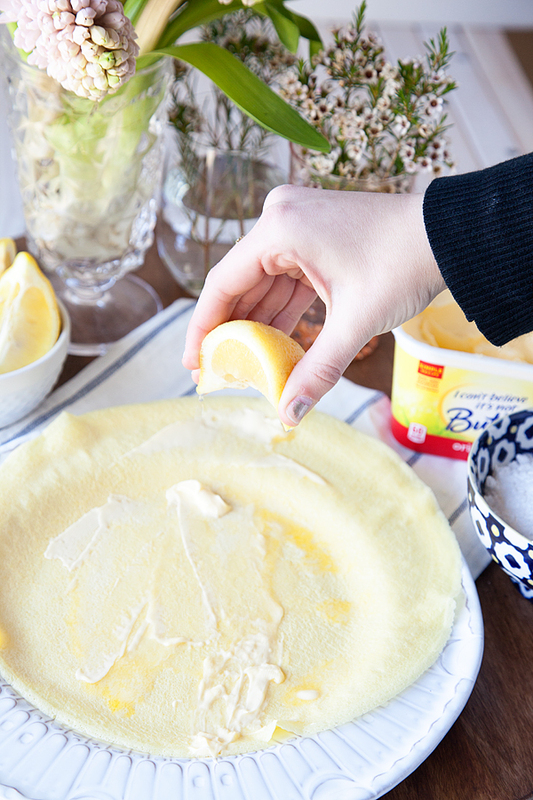 Now that I’ve solved my butter issue, I’m ready to serve up my new crêpe recipe! When it comes to making crêpes, your tools are as important as your ingredients. You will also need a blender, a large, non-stick skillet and a crêpe turner or spatula that is designed not to scratch your non-stick skillet. I brought a crêpe turner home from IKEA in Germany and so far, I have yet to find one here in the USA… A spatula will work just fine! To get started, crack all six eggs into your blender and add your pinch of salt, vanilla, sugar, nutmeg and zest from one lemon. Turn on your blender and carefully remove the lid. Alternate the flour and milk starting with the flour and ending with milk. Once you have finished blending your batter, let it sit for 2o minutes or so to rest. Now, the key to making crêpes is simple. You need to heat your pan over medium heat until it’s nice and hot. 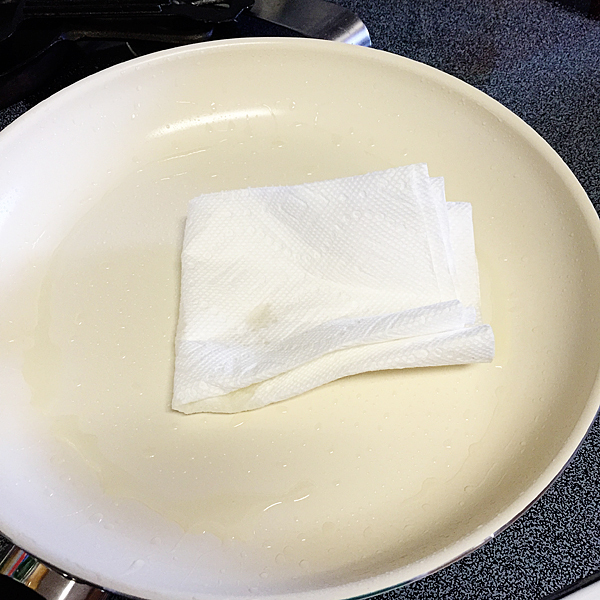 Pour in a little vegetable oil and then wipe the pan with a paper towel. Save the paper towel and wipe down the pan before each crêpe. I keep a plate next to the stove for the paper towel and my measuring cup that I use to pour the crêpe batter into the pan. It keeps my workflow super smooth. Now, you will need to decide what size measuring cup you should use to pour your batter. I have a large 12 inch pan and I used a 1/2 cup measure. For a 9 inch pan I would use 1/3 cup and a 7 inch pan I would use 1/4 cup. Now here’s the trick… make sure your pan is hot, but only over medium heat. Hold your pan up, right over the burner and pour your batter into the center of the pan as you slowly tilt the pan in a circular motion. 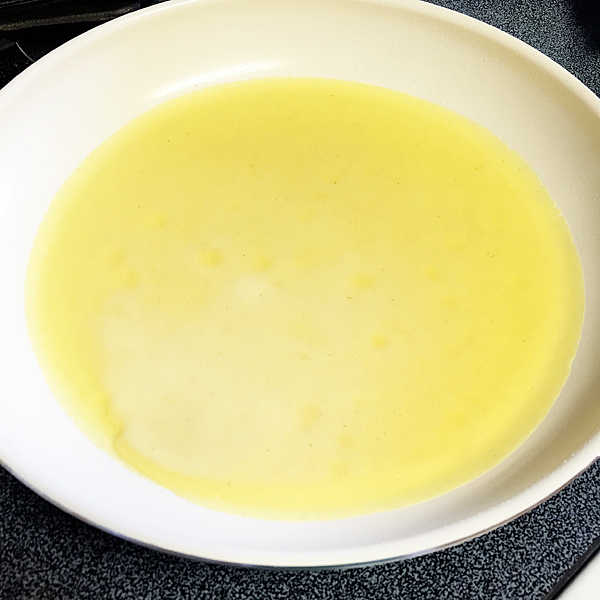 Once the batter has covered the bottom of the pan, set it back down on the burner and let it cook for 1 minute or until the sides start to pull-away from the side of the pan. 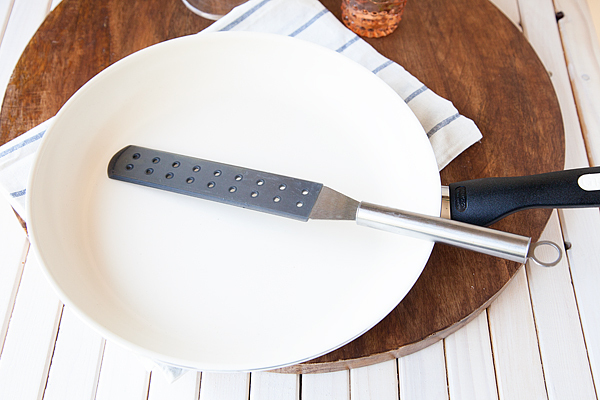 Use your crêpe turner or spatula and turn your crêpe over and cook for another 30 seconds to a minute. It depends on how you like your crêpes. I tend to like mine on the blonde side. I like them soft without much browning. If you like a crispy crêpe, you will need to cook a little longer. It doesn’t have to be pretty. 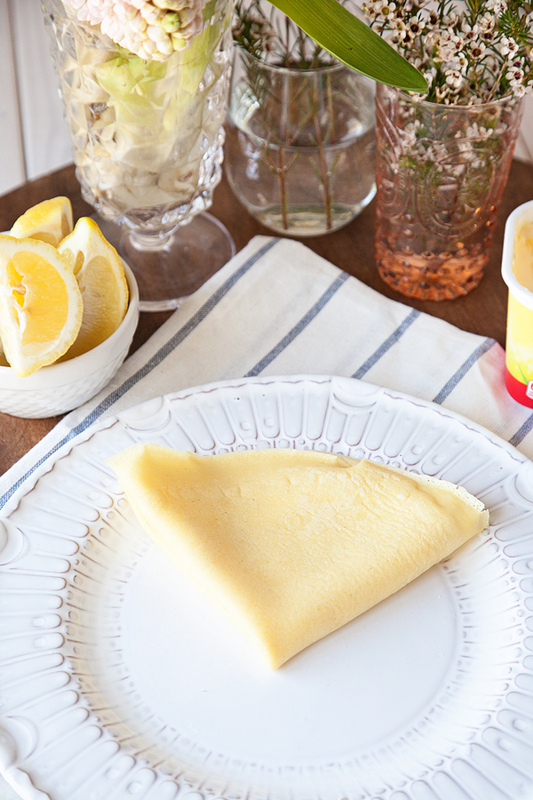 Have some lemon slices ready for your guest and have them squeeze some fresh lemon onto their crêpe. 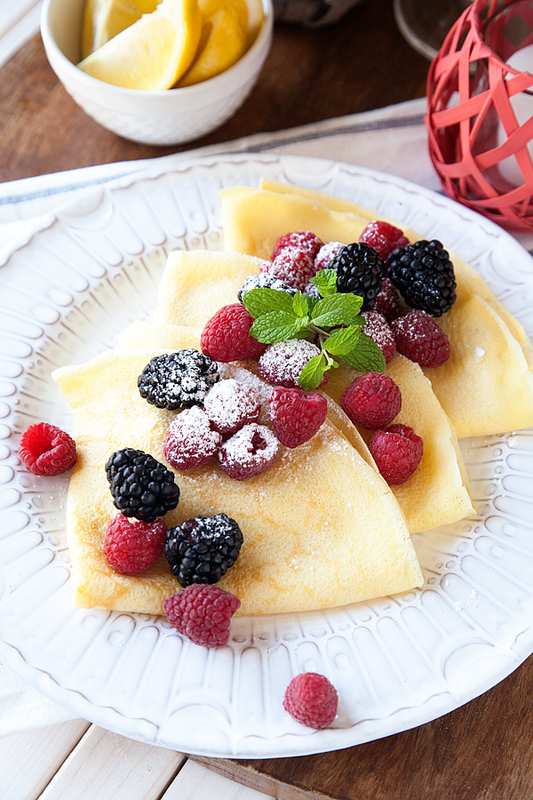 For a really nice presentation, plate three crêpes and then dress with some mixed berries. 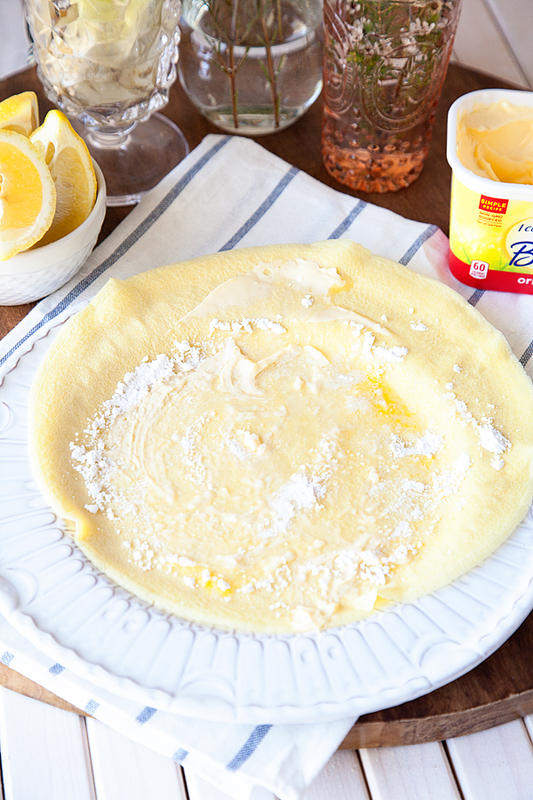 Dust your crêpes with more powdered sugar and enjoy! 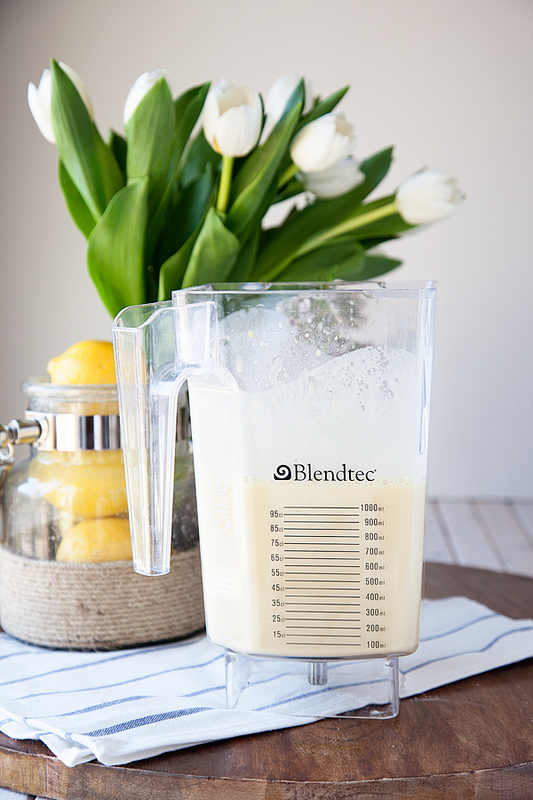 Crack all six eggs into your blender and add your pinch of salt, vanilla, sugar, nutmeg and zest from one lemon. Turn on your blender and carefully remove the lid. Alternate the flour and milk starting with the flour and ending with milk. Once you have finished blending your batter, let it sit for 2o minutes or so to rest. I Can’t Believe It’s Not Butter! sources ingredients that are not genetically modified. However, in the field-to-tub journey of making our buttery spread there is some contact with genetically modified vegetable oils, resulting in a small amount in this product. 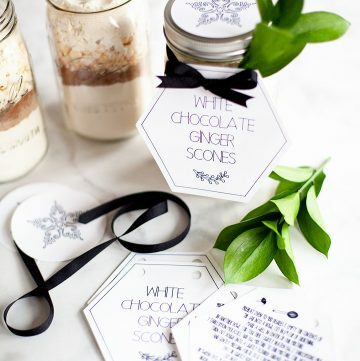 Those look pretty darn yummy, I am going to have to try these.